Lama Zopa Rinpoche with Dagri Rinpoche and Khandro-la at Kyabje Trijang Rinpoche’s cremation stupa, Dharamsala, India, November 2009. The most important thing for this life’s happiness, especially for the sentient beings you meet, is to have the thought: “I’m the servant and they are the masters, I’m the servant and they are the kings, they are the masters and I am like the dog. Sentient beings are the ones from whom I have received all my happiness. They are the dearest and most kind. They are the ones from whom all opportunities come, in relation to whom I have the opportunity to purify all my negative karma, create all the merit and attain enlightenment. So they are the kindest of all. I should use my body, speech and mind to serve others, especially the people of the center, as well as all the animals and insects.” This is also the attitude one should have with one’s family, or if you are a teacher or leader of a company, etc. The purpose of a meditation center is to take care of the minds of others, to keep the mind in virtue as much as possible. This means keeping your own mind in virtue. You have to try. It is very good to try. If you can’t do that, you can’t help others. So your motivation should be to use your body, speech and mind to create even the smallest happiness in others. Many people in the world waste their lives. People try to climb mountains no matter what risk to their life. Some people use themselves as bullets, getting fired from cannons, and so forth, unbelievable things, putting their lives in danger to achieve such insignificant happiness in this life. Taking refuge with renunciation to this life, with morality as the foundation (living in the ten virtues and abandoning the ten non-virtues), causes future good rebirth as a deva or human, especially perfect human rebirth with seven qualities, rebirth with the four Mahayana Dharma wheels, the eight ripening qualities or to be in a pure land. Renunciation of samsara and living in the three special higher trainings causes liberation from the oceans of samsaric suffering. Then, with bodhichitta, taking bodhisattva vows and living in the six paramitas and the four methods of drawing in the sentient beings in order to achieve enlightenment. Having taken initiation, living in the tantric vows, practicing pure appearance, generation and completion stages, causes one to achieve full enlightenment much quicker, within one brief lifetime of these degenerated times. Virtuous actions and virtuous thoughts need to be developed until enlightenment is achieved. Always continuously develop completing the great works, as much as one can, like collecting merit, the cause of happiness, developing realizations, and achieving liberation and enlightenment. One should never be content regarding developing positive actions, virtue, which lead to one’s own and others’ ultimate happiness, enlightenment – always strive to do more. Apologize immediately if one did some mistake, harmed others, was disrespectful or said hurtful words. Forgive immediately if somebody gets angry, is disrespectful to you or harms you. Develop courage by thinking of the benefit to others, serving others. This is the best offering to the buddhas and bodhisattvas. Excerpted from Letter to All Center Directors and Coordinators dictated by Lama Zopa Rinpoche to Ven. Roger Kunsang and Ven. Trisha Labdron, Nov 5, 2009, Dehradhun, India, and edited by Ven. Trisha Labdron. Lightly edited for FPMT eNews. 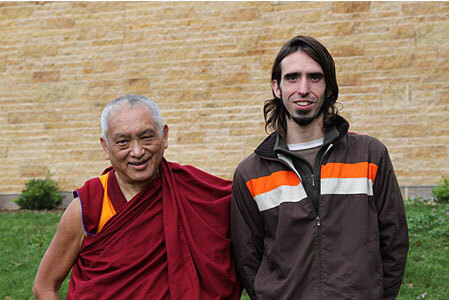 There are new photos of Rinpoche and Osel. Enjoy! In November 2009, FPMT was able to offer $19,710 for the monthly stipends of the current abbots, past abbots and main teachers of the Lama Tsongkhapa tradition, including the Ganden Tripa. These incredibly precious teachers do not receive any money from their monasteries. years, FPMT has been offering a small monthly stipend ranging from $10 to $31 to the 150 teachers of Sera, Ganden, Drepung, Gyume, Gyuto, Tashi Lhunpo and Rato monasteries. FPMT also was able to offer $8,885 for the annual Gelug exam that was attended by 540 of the foremost scholars from Sera, Ganden, Drepung, Gyume, Gyuto, Tashi Lhunpo and Rato monasteries. This year, the exam was held at Sera Monastery. This money covered the cost of travel for the monks who were traveling to Sera for the exam, as well offering the food and tea for all the monks attending. Thank you to all the kind benefactors who continue to support the Lama Tsongkhapa Teachers Fund. This project is critical to FPMT’s mission of preserving and transmitting the Mahayana teachings worldwide. Materials have been added to the Basic Program web update page, including Gyaltsab Je’s Bodhicaryavatara commentary in English, translated by BP teacher Ven. Fedor. You’ll also find several meditations and charts for Mind and Cognition in Spanish (due to the consistent karma yoga efforts of MP student Ven. Teresa) and the French translation of Minds and Mental Factors, just in time for Nalanda’s tri-lingual BP! Seven modules of Discovering Buddhism are now available online. Don’t forget Module 2, “How to Meditate,” is free. Enrollment key: calmabiding07. Check it out! Important announcement: a request was made to Rinpoche to change the name of the online program that will highlight the teachings of Lama Yeshe and Lama Zopa Rinpoche. Over time, this will contain more than just the Light of the Path teachings from the retreat in North Carolina. 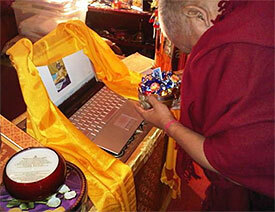 As such, Rinpoche has chosen the name Living in the Path. Going forward, Living in the Path will be the name used for the online program that will start to be available on the FPMT Online Learning Center in early 2010. NEW! Keep your prayer books up to date! Comprehensive updates for Essential Buddhist Prayers Vols. 1 & 2 and the FPMT Retreat Prayer Book are now available. If you find these updates an unnecessary hassle, please read what our Spanish translator, Luis Portillo, had to say on the topic: When I started to translate previous versions of the Prayer Book, I felt disappointed every time that I had to change the version before it was printed. Later, I understood that we were fortunate for having a teacher who looked after us and kept us moving. The worst feeling is that of success, because it makes you sleep. So don’t worry about my complaining, because it’s just a joke, I am quite open to the changes that I bet will come soon. We are on a path, so it means we have to keep moving! NEW! Comprehensive, extensive, and very inspiring publications available list from FPMT Education Services is now offered. Please print and make this list accessible as you see fit, especially to your SPCs and shopkeepers for their at-a-glance, easy-to-read catalog of resources. Following Rinpoche’s advice, the Foundation Store has Lama Yeshe statues available so all FPMT centers can have Lama on their altars. What a lovely Christmas present! Announcement! Ven. Mindrol will be leaving for a three-and-a-half month retreat at the end of December. During her absence, center requests for materials (other than those in the Foundation Store) may not be fulfilled. We appreciate your understanding! 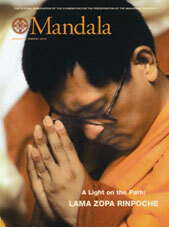 Mandala’s January-March 2010 issue, “A LIGHT ON THE PATH: Lama Zopa Rinpoche” is the fourth in a series of issues dedicated to telling the story of FPMT. This edition in the series focuses on the incredible contributions of FPMT’s spiritual director, Lama Zopa Rinpoche. Filled with Rinpoche’s artwork, advice, accomplishments and inspiring quotations, this issue is a testament to Rinpoche’s tireless work for others. Looking at the participants at CPMT 2009, one would not have missed noticing that the youthful hippies who first followed Lama Yeshe and Rinpoche have become the community’s elders. Persons over 30 years old definitely outnumbered those younger. Like any other organization, the FPMT needs to attract and sustain the interest of new members – and the question does arise of whether it is reaching out to younger people. Interestingly, it is the younger FPMT members who appear most invigorated by the challenge to ensure the FPMT stays relevant and exciting to their peer group. One of the steps they have taken is to start an online community “for young FPMT students to connect, communicate, network and keep in touch”. Do check out their ideas at FPMT Young Dharma! The reincarnation of our much missed Kyabje Ribur Rinpoche has been found! 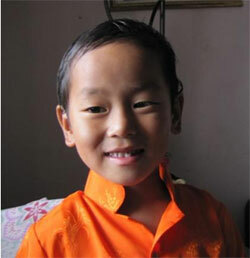 The young tulku, who currently goes by the name of Tenzin Pasang, was identified after the traditional checks and the observation of His Holiness the Dalai Lama. Born to a Tibetan family living near Sera Me, he bears out His Holiness’s prediction that the tulku will be found four to five years after the passing of Kyabje Ribur Rinpoche. Kyabje Ribur Rinpoche himself had indicated to some monks that he will be reborn near Sera Me, and had expressed the intention to return to his labrang and to continue his work of benefiting all sentient beings. On hearing that 500,000 animals were going to be sacrificed over two days at Gadhimai (November 23 to 24, 2009), Rinpoche made the observation that the efforts being made to stop it by animal rights activists and Ram Bahadur Bomjon, the “Boy Buddha of Bara,” might not have effect. Sent to the CPMT and FPMT Yahoo! Groups, that request drew strong response. Emails from America to Australia, Asia to Europe arrived at the International Office to report that so many of the sutra and prayer were recited. As it turned out, the main event proceeded as planned although at some smaller venues, the slaughter was halted amidst local protests and the international outcry. Ostensibly there was limited success – but we can trust that the effect of every good intention and prayer goes way, way further! Many thanks to those who added their efforts! Vajrapani Institute, California, needs a full-time Kitchen Manager – application closes shortly in December 2009! Tse Chen Ling in San Francisco is looking for a suitably qualified person for the position of Spiritual Coordinator – please contact office@tsechenling.org for details. And there are, as usual, many exciting opportunities to offer service in FPMT centers around the world.